Several people have asked what we did while we were on the vineyard. We have answered some of those questions in prior posts but we’ll try to wrap it up with this one. First I have to say we got exactly what we were looking for in our month on the winery. We started harvesting grapes on the first day and were involved in many aspects of the wine making process. We also learned a great deal about living on a winery and in the Piemonte region of Italy. Our hosts Ursula and Marcello were gracious and patient as we tried to understand everything we could about it all. The other WWOOFERs we worked with were all interesting, hard working individuals. The whole experience was outstanding! What follows is a somewhat annotated list of all the things we did during our stay. Betsy is keeping a very good journal of our whole trip so this is pretty accurate accounting of it all. Pretty happy to be surrounded by the wine in Marcello's cellar. He often keeps his wine here for ten years before release. Grape bunches went into this rotating machine which spit out the stems. 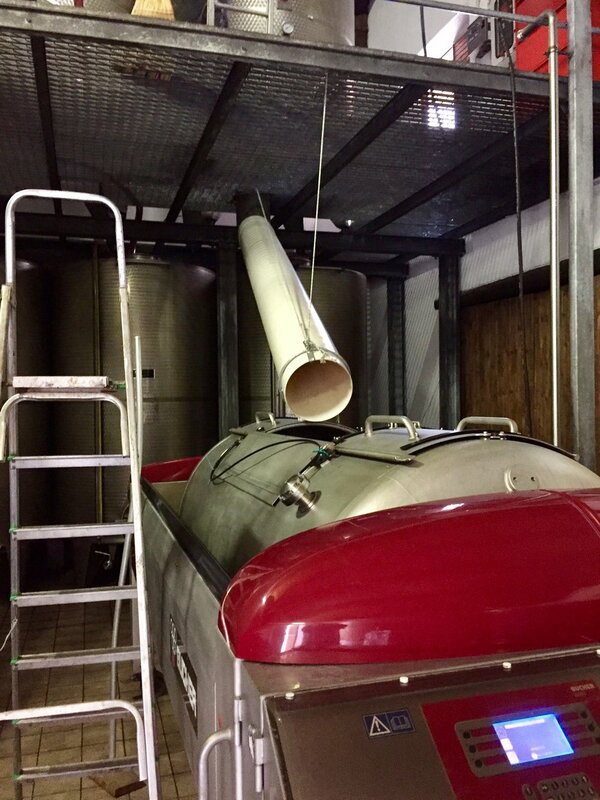 The grapes were pumped into the primary fermentation tanks to ferment on the skins for the next couple of weeks. Sauser is a very low alcohol grape juice pulled from the primary fermentation tank after only a day or two. It is the sweetest, most intense grape juice I’ve ever tasted. Marcello decided he wanted to bottle some this year. He has a small pasteurizing machine and my beer making background came in handy as I capped all the bottles. Marcello doesn’t label his bottles until he’s ready to sell them, often ten or more years after harvesting. They do all their own marketing and distribution and sell most of their wine in Switzerland, where they are from. After the grapes have spent enough time in the primary, they are moved, by gravity, to the press. The grapes are pressed and the juice is pumped into the secondary where they stay until the fermentation is complete. The skins have so little moisture left in them they are almost completely dry. We collected them into giant bags which are sold for the production of grappa. Marcello presenting me with juice fresh off the press-vino nuovo! This turned into quite the ordeal. The winery has a drain running down the middle of the rooms so when you power wash the equipment the water just drains out. During the busy harvest time this drain had gotten clogged with grapes. When we went to clean it out it seemed there was a clog in the drain underground outside. We dug up connections trying to locate the spot. My arm was purple from reaching up a pipe to try and clear it! It ended up we found the pipe was broken in a couple spots and we ended up digging it all out and replacing it with bigger, stronger pipe. · Stuffed 0ver 800 envelopes for direct marketing to clients - A really important part of the business. · Helped with meals-a lot! Betsy especially helped in the kitchen. We had three home cooked meals a day. In the whole time we were there we went out to eat twice. One of my favorites was the focaccia bread which was cooked in a big cast iron skillet on the stove top. The dough filled the whole skillet and when it was brown on one side it was just flipped over to finish it. No baking necessary! Betsy again did most of this. She enjoys the meditative act of picking fruit. See her descriptions in Top 10 Lessons from the Vineyard. Ursula did a lot of her own preserving in various ways. We often had her homemade jams, pickled vegetables, and dried fruit at the table. This particular venture was a red wine based liquor that included fennel seeds and grain alcohol. This project took several of us three days taking turns on mezzalunas chopping herbs to make several pounds of herbed salt. Ursula uses it all year long to flavor soups, meat, salads…almost everything she cooks. This was a little unsettling since it hadn’t rained in two months and the brush piles were surrounded by dry grass and close to wooded areas. I became known as Greg the Fireman. They use wood to heat the house in the winter. They use everything so we stacked everything from cut and chopped hard woods to scrap lumber and old grape vines. My least favorite job, screening out rocks, etc. from several years old sheep manure. It was then used in the garden. The Perks-Other things we got to do! As I mentioned earlier, Ursula and Marcello are fantastic, gracious hosts. On weekends they took us to neighboring cities to enjoy markets and things or loaned us their car so we could go explore on our own. Here are some of the things we got to experience thanks to their generosity. This was at a marvelous agriturismo. See more in Our First Harvest in Piedmont. On our first weekend after harvest, Marcello took us into Alba to see the market while he attended to some business. Then on the way back to Dogliani he dropped us off in La Morra. We hiked from there to Barolo, Monforte, and finally back to the winery. We hiked about 15 kilometers that day through vineyards and visited friends we’ve made on prior trips. · Went on a cruise! Again, the graciousness of our hosts. We had committed to a whole month at the vineyard but then a few weeks out we were offered the opportunity to take a Viking Cruise in the Adriatic…for free. When we contacted Ursula about this she told us no problem! More on this adventure in a future post! An amazing visit. Go check them out if you are in the area. This a luxury on the road. Loved the drying racks! This place was awesome. Literally dozens of pizzas to choose from all quickly cooked in wood fired ovens. The home and headquarters of the Slow Food movement. Again, shopping for necessities is a luxury on the road. This was amazing. Ursula made arrangements for us to stay in a B&B in the mountains. They loaned us their car and we spent two glorious days hiking in the Alps. This will probably show up in a future blog as well. One of our goals in taking this trip is to stay in places long enough to experience what it is like to live there, not just visit. On this trip to the market we felt at least a little bit of this. Technically, this was one of our duties for the winery. We went into town and picked up a bunch of produce for Ursula. We love going to the markets that move from town to town throughout the week and it was great to get to shop with the locals. We used our limited Italian and interacted with the vendors. We watched the locals to see how it was done and pushed our way to the front of the line to get the tomatoes we needed. We picked our chrysanthemums to plant in Ursula’s flowerbeds. 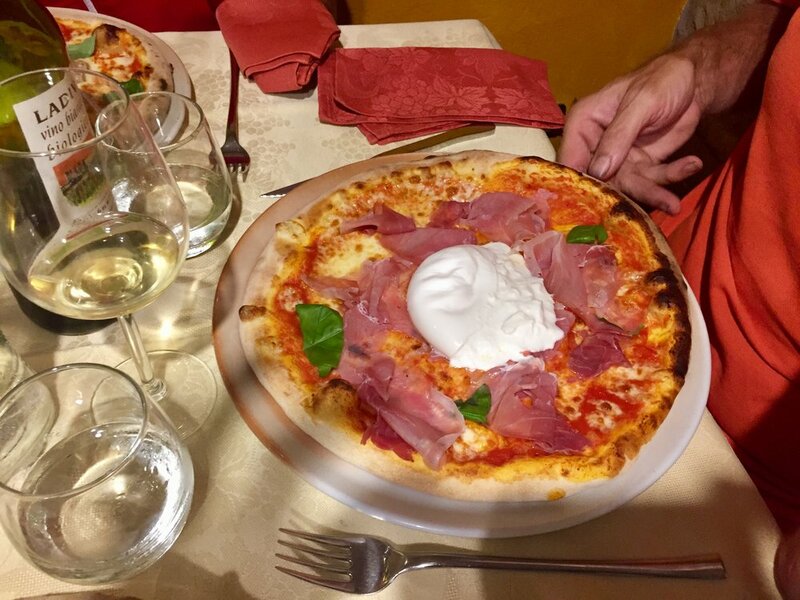 I feel like we got at least a glimpse of what it is like to live in this region of Italy that we have come to love. This was a life changing experience. Our fellow WWOOFERs were from Italy, Germany and Switzerland. Thanks to Mossimo, Eduardo, Warner, Thanks to Ursula and Marcello for making it happen for us. If you have any questions about our time on the winery just leave a comment below! Sign up with your email address to receive notice when a blog comes out!